GREAT book by a GREAT activist! 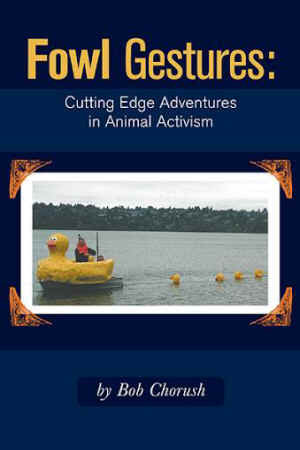 Buy Fowl Gestures: Cutting Edge Adventures in Animal Activism! Proceeds go to ZooCheck Canada. ...while wearing an elephant costume, preventing ducks from being shot by starting a hunting club and deterring people from attending the Shrine circus by reminding them of the pedophilic exploits of Spanky the Clown... These were just a few of the campaigns that Bob Chorush stickhandled during his animal activist exploits. Originally a journalist, working at one time for Rolling Stone Magazine, Bob was always an activist. He ended up in Canada when he became a conscientious objector to the Vietnam War. He was quick witted and had brilliant, hilarious and effective ideas for animal rights campaigns. These are Bob’s stories of his adventures and exploits in his own words. No matter what your experience was when meeting Bob, you never forgot him. Bob’s friends will never forget his kindness, deft language and multiple senses of humour. His friends who miss him dearly want to share his stories with you. Bob Chorush was a crazy, funny and gentle man. He was also a journalist and activist. He found himself in Canada when he became a conscientious objector to the Vietnam War. Bob had an uncanny ability to think on his feet and use the written word to his advantage. He also came up with some pretty original, wild and brilliant ideas to draw public attention to the suffering of animals. 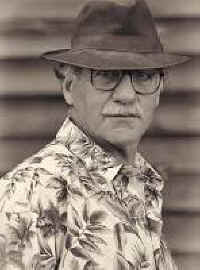 See Bob's Obituary by Lynn Terpstra.